In December 1950 the French had abandoned their northern garrisons along the Chinese border, they had been run out of Cao Bang and Lang Son in panic and had retreated to the Red River Delta. No place was safe though. The startled French soon found out that there were plenty of Vietminh cadres inside the Delta working diligently to carry out dau tranh, the Vietnamese version of Mao’s theory of guerrilla warfare. Operating clandestinely, mostly at night, they continued the harassment campaign, antagonizing and sometimes terrorizing the French and those Vietnamese who openly supported them. Ho Chi Minh and his men, invigorated by their military performance in the fall, were eager to continue the momentum. Maybe too eager. That was the scene a week before Christmas in 1950. As the people of the world made preparations for religious and family celebrations, the situation far from home on the Asian mainland was bleak. General Macarthur’s troops were scrambling for their lives in North Korea after the Chinese surprise at the Yalu River. To the south, in the Red River Delta region of North Vietnam, the French, soldiers and citizens alike, were caught in a web of fear and intrigue, and many by then just wanted to leave Tonkin as quickly as possible. Into this atmosphere of seemingly irreversible spiritual decomposition rode one Marshall Jean de Lattre de Tassigny, surely the most distinguished French commander of the Vietnam War and ultimately the most successful. He had a distinguished combat record in World War I and World War II. He was wounded five times in World War I. He was an officer of the Legion of Honor, entitled to wear the red white and blue ribbon of Napoleon. De Lattre was a division commander in 1940 when the French were defeated. Later he joined the Free French. He was promoted and commanded the French First Army during its advance into Germany in ’44 and ‘45. When the Germans attacked in the Battle of the Bulge de Lattre’s forces had just liberated Metz. De Lattre arrived in Saigon on the 17th of December 1950. He had required some convincing. After all de Lattre was already a decorated national war hero, why should he risk going out on a loss, especially for what looked more and more like a lost cause? He was a good soldier, he did his duty for France. As part of his rider contract he had succeeded in getting the French government to appoint him both Commander-in-Chief and Governor General of the colony. Therefore he exercised both political and military authority from his headquarters in Saigon. He would be the only French commander to have that leverage. De Lattre, called “Roi Jean” by many, breathed spirit back into the French forces. He changed regimental routines and instilled a strict military protocol. He immediately squelched all evacuation plans. Then, as one of his first measures, de Lattre ordered the construction of a line of concrete pill boxes, machine gun bunkers, circling the Delta. He could put second-rate troops, certainly not paratroops or Foreign Legionnaires, in these bunkers and still make it difficult for the Vietminh to move in and out of the Delta. In addition, it was hoped that the outposts might slow down any major Vietminh attack and provide advance warning to permit the French to deploy their mobile forces in defensive positions. This became known as the de Lattre Line. De Lattre also ordered the formation of a Vietnamese National Army that would become known as the Bao Dai Army (due to its veiled connection to the emperor for legitimization purposes). For the French not much was expected of these troops, but they could be trusted enough to assume garrison duties when the front-line French mobile forces moved out to battle the Vietminh. The Vietnamese parachute battalions were also part of the Bao Dai Army, yet the French commanded them and used them as though they were part of the regular French forces. They actually did earn a good fighting reputation over time. This so-called Vietnamese National Army did free up some French troops, but the French never exhibited much faith in them and so never gave them any real responsibility, thus reinforcing hard feelings in the Vietnamese, who knew they were always going to be treated as mere puppets by the French. For more on the French force structure in Vietnam read The French Armed Forces at War, 1945-1954. At any rate, de Lattre did have a plan, but would he have time to carry it out? In January 1951, General Vo Nguyen Giap launched his “General Counteroffensive” designed to crush the reeling French army once and for all in the Red River Delta. The Red River Delta was where the highest concentration of ethnic Vietnamese lived. Known as the Dragon’s Belly area, the region around modern Hanoi is where the Vietnamese culture and way of life got started thousands of years ago. It was the key strategic and symbolic prize. The new emphasis would be on conventional battles. Giap had made a fateful decision. He decided it was time to shift to phase three revolutionary warfare. At his jungle headquarters General Giap was laying plans for the anticipated coup de grace, an all-out offensive on the Red River Delta fortress using big army conventional tactics. Basically his plan was to overwhelm the ailing French forces by attacking apparent weak spots in their defenses with large infantry formations, similar to the human wave attacks employed by the Chinese Communists in Korea. Clearly this new way of fighting posed new logistical considerations for Giap. His Vietminh divisions were heavily dependent on local suppliers for rice, particularly rice from the Thanh Hoa area. These areas, and access routes to and from, had to be kept in Vietminh hands, yet Giap had to keep his divisions geographically separated so they wouldn’t exhaust local food supplies. It was a delicate balancing act, one that frequently required violence to maintain. His divisions were spread out as follows: in the Viet Bac base area north of the Red River Delta, from west to east, the 312th, 308th, 304th and 316th divisions. The 320th Division was based south of the Delta near the coast (largely responsible for holding Thanh Hoa). And last, the 42nd and 64th Regiments were already inside the Delta busy conducting dau tranh operations. The upshot: in order to concentrate his forces en masse against a particular French stronghold, Giap would first have to move large numbers of troops into place. This hampered his strategic mobility and made surprise more difficult to achieve. Nevertheless, General Giap was confident, and he was eager to capitalize on his momentum. He launched the first attack against the northwestern defenses of the Delta, against an isolated French outpost at a place called Vinh Yen, in the area where the Red River joins the Black River and the Clear River runs down from northern Tonkin. His plan was to use the outpost as bait to draw in French mobile reserves and destroy them. He committed two divisions, the 312th and the 308th to the attack, having moved them undetected in to position. In a feat that foreshadowed his greatest logistical triumph years later at Dien Bien Phu, Giap achieved both strategic and tactical surprise at Vinh Yen. He had marched two divisions many miles, and yet the French didn’t know when, or where, the Vietminh were going to attack. The French units at the point of attack had no warning when Giap ordered a regiment to storm Vinh Yen. Just as he had surmised, the French predictably sent a mobile group charging down the road to the rescue. With their arrival an entire Vietminh division came out of the jungle. De Lattre then sent in another mobile group. Another Vietminh division appeared. Suddenly the Vietminh had two mobile groups pinned down and surrounded. The Vietminh attacked in mass formations in daylight. Several human waves came out of the jungle to charge the dug in French positions. It was a virtual shooting gallery for the French defenders. There was a haze of blood, barbed wire and machine gun fire, the French soldiers valiantly hanging on. In an act of pure bravado, de Lattre flew into the position by light aircraft to reassure the officers and steady the troops. It worked. With Giap’s troops out in the open and vulnerable, the French commander upped the ante. He called in all available air forces to step up the carnage. From out of the skies came the death machines, guns blazing, carrying napalm, the feared jellied gasoline that burns everything it touches. Dropped in big aluminum tanks from low-flying fighter-bombers and refurbished Junkers 52s it would spread as it burned, a rolling wave of fire. The French pilots flew low over the Vietminh and rolled the drums out the cargo doors. The results were devastating for the Vietminh, their casualties horrendous. The battle went on for four days, with both sides suffering significant losses, finally the Vietminh melted back into the jungle. The French were left in control of the smoking valley. Giap was smarting, but he was not to be deterred, he would regroup and attack again, but he would never again expose his infantry to French air power in the open in daylight. Giap and his intelligence staff had determined that the 316th Division could break into the Delta from the northeast through the town of Mao Khe. The goal was to capture the road between Hanoi and Haiphong, cutting the French off from resupply by sea. Giap again did the logistical heavy-lifting, bringing in reserves of ammunition and food, much of it moved without the benefit of automobiles. He also redeployed elements of the 351st Heavy Division toward Mao Khe. Once again Vietminh troops moved into attack positions before the French had any idea they were there. Giap gained both strategic and tactical surprise. This time elements of the 316th Vietminh division jumped off at night and immediately overran and bypassed several French strong points. Soon they were fighting their way into the town of Mao Khe. All was not lost for the defenders though, a Moroccan armored car unit continued to fight on despite seeing all their armored cars knocked out. Nearby a small Tho tribal unit held on to its isolated position in a church behind Vietminh lines. Unlike at Vinh Yen air power was not particularly effective at Mao Khe. The Vietminh had learned to stay under cover and to stay very close to the French once in combat, a tactic called “hugging the enemy.” But what the Vietminh had not considered was the intervention of naval forces. The French were able to bring in a parachute battalion by landing craft, reinforcing the Moroccans at a crucial moment. In addition they brought destroyers up the tidal estuary and trained their heavy guns on Vietminh positions. From there they wreaked havoc on Giap’s forces. The resistance of the garrison, the reinforcements brought in by sea, and the naval gunfire, convinced Giap to retreat once more. The Vietminh commander was forced once again to pull back and lick his wounds. But Giap was resolute, he was determined to maintain the offensive. But where next? He decided to hit a perceived weak spot at a location in the southeastern region of the Delta, along the Day River. It would be a coordinated operation with the 320th division attacking across the Day River to link up with the 42nd and 64th Regiments. The 320th struck on the 29th of May. The wet monsoon had begun, and Giap and his staff assumed that the foul weather would hamper the French. The 316th and the two regiments inside the Delta also attacked simultaneously to divert French attention. At first the offensive looked promising with Vietminh troops making impressive initial gains. But logistically the Vietminh had a big problem, their shortage of artillery was even more pronounced than in the two previous attacks. Adding to their woes, the terrain was open and the monsoon rains made it difficult for them to move supplies, even by human porters and bicycle. Conversely, French air power and armor controlled the open spaces and French dinassauts dominated the Day River. The French went on to teach Giap another lesson. Once again the Vietminh had to break off their offensive. Once again they suffered heavy casualties. Thousands more of Giap’s troops were killed and wounded. Among the French causalities was Bernard de Lattre, the only son of General Jean de Lattre. Ironically, as Bernard Fall noted, the Vietminh were defeated in almost exactly the same place that the Chinese defeated the Trung Sisters over a thousand years before. Interestingly, the Day River attack fell in the area of the largest Catholic population and greatest Catholic strength in Vietnam. The Catholics had shown luke warm support for the French, but they tried in vain to avoid the fight against the Vietminh. In fact, the French believed that the Catholics had advance warning of the Vietminh attack in the Day River area and chose to keep it quiet from them. Whatever the case may be, the general’s young son, Lieutenant Bernard de Lattre, was in command of an exposed outpost in the battle. Tragically he was killed early in the attack. His grieving father never forgave the Catholics, he blamed them for the loss of his son for the rest of his life. Giap had gone to Phase Three prematurely and was soundly defeated. How would de Lattre respond? Now it was the Viets who were on the defensive. The tables had seemingly turned in de Lattre’s favor, but the price had been personally very high– he had lost a cherished son in the process. Having paid such a price the grand old general was determined to finish what he had started and win. His answer was Operation LOTUS. LOTUS would be a lightning thrust from within the Red River Delta with superior forces attacking outward. It would be aimed at one of three possible targets: 1) an attack north into the Bac Viet; 2) an attack south along the coast into the Than Hoa region; 3) an attack west toward Hoa Binh. De Lattre apparently rejected out of hand the notion of going for the Vietminh supply lines to China (option 1). That was basically a repeat of Operation Lea a few years earlier. He also rejected Than Hoa as an objective (option 2) even though Than Hoa was a major communist priority. A French victory there would have dealt the Vietminh a significant blow. The loss of Than Hoa would have cut off the principal Vietminh rice supply and likely would have caused major logistical and psychological anxieties for Ho Chi Minh’s legions. In retrospect the general’s decision to do battle elsewhere may have been a bad tactical call. Instead de Lattre turned his attention to Hoa Binh. Located in the mountains west of the Delta, Hoa Binh was the mecca of the Muong people. Controlling it had important political and psychological value for a tribal people who had allied themselves with the French against the Vietnamese communists. The Muong were the descendents of lowland Vietnamese who took to the hills to get away from Chinese taxation in the eighth and ninth centuries. By virtue of their isolation they retained an ancient dialect of the Vietnamese language and as such were considered barbarians by the Viets. Suffice it to say, the two peoples did not get along, usually to the detriment of the Muong. The French courted the Muong as part of their divide and conquer strategy, the two had become solid allies, so maintaining them in their own capital was a method to solidify those ties. Another feature that made Hoa Binh an attractive target for de Lattre’s crucial offensive was that it lay astride the Vietminh supply line between Than Hoa and Giap’s base areas in the Bac Viet. Seizing Hoa Binh would cut the rebels off from rice and other vital supplies. The French also believed that they could expand their defensive perimeter to include the greater Hoa Binh region to protect its pro-French, tribal, population. One more important influence on de Lattre should be noted. He, like most of his colleagues in the French command, believed strongly in the concept of the set-piece battle. This desperate search for the elusive engagement whereby the enemy would be drawn out in the open and destroyed in one great, and famous, battle had become an obsession with the French Command in Indochina. Marshal de Lattre was a true believer and may have felt that the conditions were right at Hoa Binh to provoke such a scenario– the Hoa Binh area presented favorable terrain where he could combine infantry, air, and riverine forces in battle, he had the support of the local Muong tribes in the area, and most importantly he could threaten Giap’s vital resource (rice). De Lattre believed he could force Giap to expose his troops to save it. Giap had other ideas. Looking back, the decision to go west to Hoa Binh instead of attacking south into Than Hoa was arguably the single decisive error made by the French commander. It would be extremely difficult for the French to win the war without the active support of a good portion of the native Vietnamese. Recall that, unfortunately for the French, the Muong and Vietnamese were bitter foes. For those Vietnamese fighting and dying for French interests it must have been a bitter pill to swallow when they learned that the French strategy was driven by alliance with the Muong! In 1951 there were about two hundred thousand Muong in Tonkin as opposed to nearly twenty million Vietnamese, the French could ill-afford to alienate the Vietnamese inhabitants in favor of the Muong. But that is precisely what happened. Clearly, General de Lattre’s myopic view of local politics and history contributed to the curious decision to fight at Hoa Binh. Operation LOTUS kicked off on the 13th of November, 1951, in the midst of the dry monsoon season. The offensive commenced with a three battalion parachute drop on Hoa Binh. Immediate results were encouraging, tactical surprise was achieved and the the rice supply line was suddenly severed. Back in the Delta a major ground force—fifteen infantry battalions, seven artillery battalions and two armored groups supported by combat engineers—fired up and drove toward Hoa Binh along RC 6. Twenty dinassauts—riverine task forces—started up the Black River. Three days later, on the 16th, the French forces linked up at Hoa Binh. The Vietminh quietly faded into the jungle. The French had thrown the first punch, now Giap had to take it. He quickly repositioned his forces– he ordered the 316th and 320th Divisions to the Delta to harass French forces and supply lines, he sent the 308th Division to surround Hoa Binh, and he ordered the 304th Division to interdict RC 6. Then the Vietminh rerouted their rice supply line to the southwest, bypassing Hoa Binh. The flow of rice to the Giap’s troops resumed. On December 9th, 1950, the Vietminh launched their first ambush against a garrison on the Black River at a place called Tu Vu. The see-saw battle featured human wave attacks and numerous ambushes by the Vietminh. According to Fall “the attack on Tu Vu was a portent of things to come in its intensity and brutality.” The French were ultimately forced to retreat from the Tu Vu garrison in early January, giving the Vietminh an entire riverbank from which to launch ambushes on river convoys. The cost had been high though; more than 400 Vietminh soldiers lay dead on the field. Giap was honing a new style of tactics designed to painstakingly grind down French posts covering the approaches to the river and town. Ambushes along RC 6 soon followed. It wasn’t long before the French had committed significant forces to garrisoning hilltops and security positions along RC6 and the Black River. The cycle of response and counter-response escalated… to the ultimate benefit of the Vietminh. Like a creeping vine they deployed multiple regiments around Hoa Binh along with 120 millimeter mortars to support their frequent attacks. They carefully surveyed the French positions well in advance, and the recoilless rifles and mortars were precisely targeted on key machine gun bunkers and command posts. The Moroccans, Algerians, and Legionnaires who defended the forts fought magnificently, but in the end the positions were usually overrun. A few survivors might fight their way back though the Vietminh into the jungle. If they were lucky, they were rescued by a relief force the next morning. many were not. The ensuing battle at Xom Pheo was hard-fought and particularly terrifying. Much of the fighting took place at night in darkness. The sudden flashes of the sappers’ bombs, the screeching horror of incoming mortars and recoilless rifle fire, mixed with the sound of bugles and the blood curdling yells of onrushing infantry, all of this made for a truly shocking experience for everyone involved. The French defenders were badly mauled but refused to fall. Vietminh losses topped 700 dead, their bodies scattered about Xom Pheo’s perimeter in the morning. The assault failed to take Xom Pheo but the Vietminh 304th Division was gaining firm control of the approaches to Hoa Binh along RC 6 anyway. The next day they occupied more strategic high ground, ambushing and nearly destroying a French Mobile Group that tried to pass below. The second pincer around Hoa Binh was closed. It was time to call it quits in Hoa Binh. But the architect of the battle was not around to see it through. Marshal de Lattre had developed prostrate cancer. He had been evacuated to France. The famous general died a short time later, his legacy in Vietnam mixed. One wonders what it would have been had he chosen to go after Than Hoa instead of Hoa Binh? For the revered old general it no longer mattered. Salan quickly ordered disengagement from Hoa Binh. Easier said than done. Yet the French had learned a few things over the years, for instance they didn’t blow up the ammunition dump to announce their departure! The evacuation plan was given the code name of “Operation Amaranth” and involved a three leap withdrawal along RC 6. It was a sophisticated plan, dependent on a massive naval convoy temporarily re-opening the Black River combined with a major troop thrust to briefly clear RC 6. On February 22, 1952, the French began their tactical withdrawal from the Hoa Binh salient. Impressively, they pulled it off. They caught the enemy by surprise and made it out nearly unscathed. By the end of February they were back inside the Red River Delta, behind the de Lattre line. They even managed to evacuate most of the Muong soldiers and civilians from Hoa Binh. As it turned out it was a textbook operation, but it was a retreat. With the French debacle at Hoa Binh the pendulum had swung back in the Communists’ favor. The French were back on the defensive. Once again the Vietminh went over to the attack. And even though his tactics had worked beautifully at Hoa Binh Giap was made painfully aware of the solid ties between the French and the mountain tribes in the northwest, ties that threatened the Vietminh rear areas and possibly their ability to be supplied by Mao’s China. His fortunes would be greatly enhanced if those alliances could be interdicted. It was time to nail down loose ends, and to capitalize on recent French misfortunes, but how best to do it? Another direct assault on the Delta was still too risky. Better to try provoking the French into coming out from behind their siege defenses back of the de Lattre Line. Giap was anxious to repeat the successful tactics learned at Hoa Binh. In his winter-spring campaign he hoped to draw the French into battle by attacking something they would have to defend, in a place where they were not strong. That place was Laos. Part of the Giap’s attraction to Laos was political. The French had created the French Union of Indochina, consisting of the nominally independent nations of Vietnam, Cambodia, and Laos. Unlike the Vietnamese, the Laotians, ruled by King Sisavang Vong, had amicable relations with their French masters. Therefore much of the fleeting French legitimacy in Indochina was based on the viability of the pro-French Laotian government. That meant that Laos had to be protected militarily. Giap of course knew this. By attacking French-controlled Laos, Giap sought several military outcomes: further isolate the Red River Delta by bringing the highlands of western Tonkin under Vietminh control, force the French to deplete their troops and fight far away from their bases in the Delta, and demonstrate to the hill tribe soldiers fighting alongside their French masters that they were on the losing side. His operational objectives were the Royal Capital of Luang Prabang and the Plaine des Jarres. His political objective was to deal an embarrassing blow to the French and drive a wedge between the component parts of the so-called Union of Indochina. In addition, Ho Chi Minh and his ruling cadre, including General Giap, realized that the Laotian border region would be a crucial battleground in the years to come, so they wanted to force the tribal elders there to think long and hard about alliances with the French. This life and death rivalry for the affections of the T’ai hill tribes was an important feature of the war. Events a year later at the epic battle of Dien Bien Phu would show that the Vietminh had made their point, the scare campaign against the T’ai bore fruit. As the southwest monsoon came to an end in 1952, Giap started moving his troops into battle order. He ordered the 148th Regiment, the 312th Division, the 308th Division, and the 316th Division out of the Bac Viet and into jump-off positions north of the Red River. Both the 308th and 316th Divisions left elements behind to guard their base areas. In addition, the entire 320th Division remained in place to protect the Than Hoa region and its life-giving stocks of rice. The 1952-53 campaign would proceed in two phases. Why two phases? basically for logistical reasons. The Vietminh couldn’t stockpile and move enough supplies—especially rice and arms—to support a continuous advance all the way from their base areas in the Bac Viet to Luang Prabang and the Plaine des Jarres. The first phase was to carry the Vietminh to the Black River and establish bridgeheads on the southern bank. Then, after a pause of several weeks to bring up more supplies, the second phase would begin, aimed at Luang Prabang and the Plaine des Jarres. The battle for the T’ai Hill Country kicked off off on October 11, 1952. 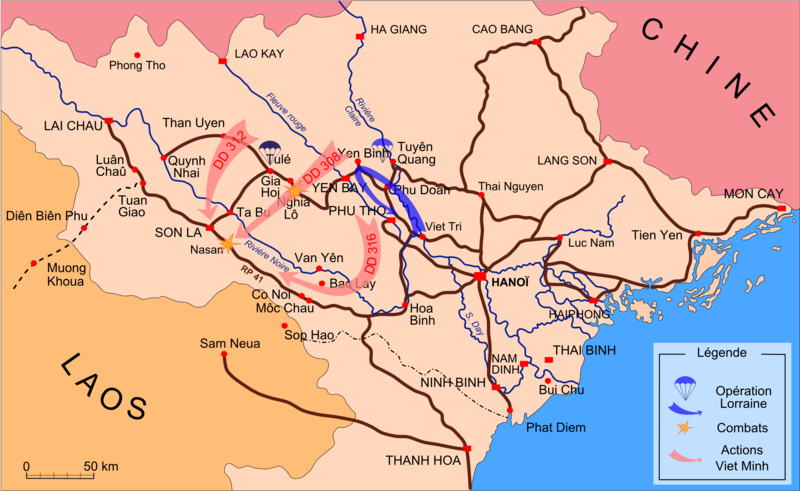 Giap’s regiments crossed the Red River without opposition and advanced rapidly to the southwest. The area into which the Vietminh were advancing was under the control of pro-French partisans, principally the T’ai. T’ai partisans had seized the region and held it for the French in 1947 at the same time as operation LEA, but the French had done little to exploit the hill tribes’ anti-Vietnamese tendencies. In October of 1952, all the French had in the area were a handful of indifferently armed light battalions of T’ai supported by a few regular French battalions. The French didn’t wake up to the potential of an anti-communist guerrilla movement in the highlands until it was too late. Giap’s forces were on the march. The better part of three Divisions– the 308th, 312th, 316th– had successfully forded the Red River and were advancing headlong southward across a 40-mile front. Each division had close to 10,000 men. Bernard Fall: “The French line of posts immediately to the west of the Red River still remained as weak and tenuous as ever and the city of Nghia Lo, though somewhat better fortified and now defended by about 700 men, still was no match for a determined Commuinst attack led by a 10,000 man division equipped with recolless cannon and 120mm heavy mortars. “In less than six days after the first crossing of the Red River, the 308th Division had swept ahead of itself all the small French outposts and had appeared across 40 miles of jungle in front of Nghia Lo. Once more Communist camouflage had been perfect. The first inkling the French had that they were about to be attacked was when, on October 17 at 1700, an intense mortar barrage fell with extreme accuracy and ferocity on Nghia Lo Hill, smashing the barbed wire, ploughing passages through the mine fields, and knocking out French gun crews. At 1730, the dreaded cry of “Tien-len!” was heard and Vietminh infantry appeared on top of the battered defenses. On October 17, to give their forces in the path of the Vietminh advance a chance to escape, the French dropped a parachute battalion, the newly formed 6ème Bataillon de Parachutistes (6th Colonial Parachute Battalion, 6 BCP for short), to block Tu Le Pass, the one navigable path through the mountain range between the Red and Black Rivers. 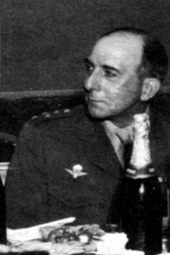 6 BCP was commanded by Major Marcel Bigeard. They fought a bloody but successful rear-guard action and held the Tu Le Pass long enough for French forces to get away. Then they themselves had to fight their way through. They suffered extremely high casualties in doing so. In one action, a rear-guard battle and escape from hilltop post of Muong Chen, 80 T’ai irregulars led by 4 of Bigeard’s men fought off a Vietminh attack but were forced to flee. They were tracked and harassed by Vietminh guerrillas and helped by sympathetic T’ai tribesman during the strenuous ordeal. Those who survived finally emerged from the jungle several weeks later after a harrowing journey through dense jungle. According to Fall there were 16 of the original 84 left alive and they were ” barely shadows staggering along.” Bigeard had lost 3/5 of his battalion, but worse, he had been forced to abandon some of his wounded on the battlefield, many were taken prisoner never to be heard from again. By and large the Vietminh had reached their phase one objective by mid-November. They had swept out of their base areas in northern Bac Viet and had quickly moved into position. They had reached the Black River and crossed it in places. In doing so they had overrun French hill posts at Nghia Lo and Muong Chen and they had hunted Bigeard’s 6 BCP almost to extinction. The result was Operation LORRAINE. It was a massive assault consisting of 30,ooo men. According to Bernard Fall it was the biggest single operation in the French phase of the war. Salan’s primary objective for LORRAINE was to force Giap to reinforce his base areas and protect his supply lines thus drawing off troops needed for the battles in the highlands and the drive for Laos. This presumably would buy time for the French to move defensive forces into place in the highlands and Laos. And of course, he hoped he might be able to lure Giap into a set-piece battle under favorable conditions by threatening his vital rear bases. As mentioned, this was a massive operation. The French forces committed to Operation LORRAINE included four Mobile Groups, an Airborne Group with three parachute battalions, two independent infantry battalions, two battalion-sized armored sub-groups, two tank destroyer squadrons, two armored reconnaissance squadrons, two artillery battalions, three battalions of combat engineers and two Dinassaut. The plan was bold but it was tactically complex. Two armored task forces were to cross the Black River by pontoon bridge just below its confluence with the Red River, secure the area to the immediate south and west, then cross back over the Red River and drive north to capture communist supply dumps at Ngoc Thap. After securing this first objective the task force would then drive twenty-five miles north up the western bank of the Clear River to a place called Phu Doan. They would wait there to be reinforced by three battalions of paratroops dropped in and ferried across by a riverine force bringing heavy equipment and additional reinforcements. The French units executed the plan perfectly and everything went well. The initial river crossing of the Black River occurred on October 29, 1952. By 4 November (Eisenhower’s election day in the U.S.) the French had secured their left flank and established three bridgeheads on the north bank of the Red River. By November 7th they had secured a good swath of the area between the Red and Clear Rivers. On the 8th, an armored task force drove north to Phu Doan, fighting its way past a Vietminh rear guard in the Chan Muong gorge. The airborne drop and rendezvous with the riverine force took place exactly on schedule. On the 13th, after consolidating their position, the French sent their armored spearheads another thirty miles northwest along the western bank of the Chay River, a tributary of the Clear paralleling the Red to the southwest, reaching a point well north of Yen Bay. “On the Communist side, the problem was fairly simple. Since the approximate strength of the French thrust was well known, as well as its direction, the Communist High Command had to take a calculated risk in estimating that the French thrust would run out of steam before it could reach the really important supply centers at Yen Bay and Thai Nguyen. General Giap decided, therefore, to proceed with his offensive into the T’ai country, but amputated one regiment from each of two of his divisions to cover his rear. So Giap didn’t fall for the French maneuver. The wily old veteran had covered his bases. By doing so he had increased his own odds for success. He had left the 36th Regiment of the 308th Division behind shadow the French force and the 176th Regiment of the 316th Division to protect the main supply dumps further north. After a skirmish with the French forces at the Chan Muong gorge, the 36th broke off contact and faded into the jungle; the 176th held its position. By November 13, Salan faced a tough decision. His assault force had lumbered quite far north to a point only fifteen miles from the main Communist supply dumps. They were close, but they were separated from those dumps by a low ridgeline defended by the 176th Regiment. LORRAINE had come this far– now, facing a fresh Vietminh regiment standing between his forces and pay dirt, and another enemy regiment harassing his lines in the rear, Salan had to pull the trigger. His primary objective lay forward, but by going for it his window for retreat might close altogether. Salan got cold feet. He would not risk the loss of another task force, it would be too devastating to French morale both in country and back in Paris. So, accordingly, on November 14, Salan ordered his forces to withdraw after penetrating hundreds of miles into Vietminh territory. We will never know what may have happened had Salan decided to drive on to his objective and try to seize the bases around Yen Bay? What we do know is that the retreat was no picnic for the LORRAINE task force. On the return journey, the 36th Regiment caught them in a bloody ambush in the Chan Muong gorge. The French fought their way through but they suffered significant casualties (approximately 300 men), they were lucky to get as many men out alive as they did. Within days of the decision to retreat, Operation LORRAINE was through. The French were back to their starting place and the Vietminh offensive into T’ai country had not faltered. The French had captured and destroyed significant quantities of communist supplies, but had left the main dumps untouched. They had suffered about 1,000 casualties in the process. More important, they failed in their primary purpose. In sum, both operations LOTUS and LORRAINE ended in failure for the French. The mythical allure of the set-piece battle, the idea that they could somehow maneuver the enemy’s hard-core regular divisions into a situation where they could be destroyed in one great battle, had been dashed on the rocks of Hoa Binh and the Chan Muong Gorge. Yet, even after the costly setbacks suffered by de Lattre and Salan, the desperate obsession with the ultimate set-piece battle continued until the end of the war. In fact, the most famous set-piece failure of the war was yet to happen– it would take place at Dien Bien Phu– and it would carry the name of the Salan’s successor, Henri Navarre (The Navarre Plan). Giap had already made the mistake of exposing his troops in set-piece battle, in 1951, against de Lattre at Vinh Yen. Unlike his French adversaries he was not going to repeat it. One interesting side note: on November 9th as a tank company from Mobile Group 1 pushed north toward Phu Hien, they made a curious discovery. They found the first Russian-made Molotova truck plus a cache of Russian weapons. This was proof that the Soviets had joined the war on Ho Chi Minh’s side. By war’s end there would be many hundreds of these trucks making vital contributions to Vietminh logistics, and Russian anti-aircraft guns and 120mm mortars would be ubiquitous, but on that fall day, the men of Mobile Group 1 had uncovered the first few pieces of evidence. Little did they know they were looking at the future. There was a brief pause in the advance while the Vietminh brought up supplies and reinforcements. Then the Vietminh launched a series of attacks against a French airhead—an isolated outpost with an airstrip for re-supply and reinforcement—at Na San. Between November 23rd and December 2nd, 1952, Giap launched regimental-sized attacks against the Na San “hedgehog.” They were thrown back with heavy losses. The French were helped by poor Vietminh intelligence. The local tribes, mostly T’ai, were hostile to the Vietminh, most either fled or provided no information. It so happened that the Vietminh badly underestimated the size of the garrison and strength of the forces protecting the position. Na San was important to Giap because it lay astride one of the primary northeast-southwest trails the Vietminh used to move supplies. Giap’s logisticians needed unhindered access to the trail if they were to fully support the 316th Division’s drive south to the Plaine des Jarres. By holding Na San one controlled the trail, that simple. The French had organized the strong-point and rapidly fortified it with four infantry battalions, one artillery group, and engineering forces airlifted in around the clock. They did all of this in less than four days. “In late 1952 Salan had established an air-supplied strong point in the valley of Na San to protect Laos and the T’ai region. He had also seen the mountain-ringed valley as the ideal rendezvous point for French units forced to abandon their border outposts. By fortifying Na San with its usable airstrip– fifty minutes flying time from Hanoi– he had hoped to tempt Giap into a trap where his frontal assaults would be smashed by French aircraft and artillery (set-piece battle again). Salan had chosen the tough, one-eyed parachute officer Jean Gilles, then a colonel, to command at Na San. “The Vietminh 308th “Iron” and 312th Divisions attacked the defenses on November 30th. A strongpoint to the northeast of the airstrip held by T’ai irregulars cadred by Moroccans was overrun by Vietminh infantry led by sappers with bangalore torpedoes. A heavy mortar barrage supported the assault. The next morning at dawn a counterattack (with fixed bayonets) by the 3rd Colonial Parachute Battalion retook the position. The Vietminh attacked again. These were pyrotechnic affairs with heavy casualties on both sides. On the morning of December 2, a strident bugle call heralded the Vietminh withdrawal. Over 500 enemy dead had been found in and around the French defensive wire. In Hanoi, the satisfaction over the “victory” at Na San had obscured the fact that the small garrison at the nearby post of Dien Bien Phu had been evacuated under Vietminh pressure. “The Vietminh may have “broken their teeth” on the defenses of Na San, for which Colonel Gilles had been promoted to the rank of Brigadier General, but the veteran campaigner had remained unimpressed. For him, the troubling fact that the enemy had taken one of his fortified hill positions in a night attack and held it for twelve hours under artillery fire and napalm attack had called for a reassessment of the value of air-supplied strongholds. First Phase Assessed– Who won? The results of the first phase clearly favored the Vietminh. The French had lost control of almost the entire area between the Red and Black Rivers. The T’ai still fielded significant partisan forces, but the French had let them down badly. The French had also incurred significant losses in the 6th BCP’s defense of Tu Le Pass and in Operation LORRAINE. The one bright spot for the French was the successful defense of the Na San airhead. They had demonstrated that they could fly in troops and supporting arms faster than the Vietminh could reinforce their attack columns. In this they were helped by the increased scale of American support. For the first time, they were receiving significant numbers of C-47 transport aircraft, far superior to the antiquated Junker 52s on which they had been dependent. Between the first and second phases of the Winter/Spring campaign, the Vietminh sprang another ominous surprise on the French; they fielded two independent regiments, the 84th and 95th, in the Central Highlands of southern Annam below the 17th parallel, and attacked Pleiku, Kontum and Dak To. The French held, but now they had another front to defend. And now they had to face the reality that the Vietminh could field and support two entire infantry regiments over a thousand miles from their primary base areas in the Bac Viet. The French had a serious new problem to deal with. The unfolding pattern of operations was clearly developing in favor of the Vietminh. They were the aggressors while the French were operating in an entirely reactive manner. The Vietminh were successful in keeping their attacking forces concentrated. The French were forced to disperse their maneuver forces to defend a multitude of fixed objectives. on the 1st of April, 1953, as dry monsoon season closed out for another year, General Giap, after building-up his supplies, commenced his Spring Campaign (Second Phase) by launching dual spearheads on Luang Prabang and the Plaine des Jarres. To get there his troops would have to advance through some of the most incredibly difficult terrain on earth. Once again, the former schoolteacher showed an amazing knack for logistical planning and execution, he chose the optimum routes and carefully stockpiled supplies forward along their route of march. But in war, things don’t usually go as planned. In an act of bravado that must have struck the French as craziness, the Laotian King Sisavang Vong refused French recommendations that he leave Luang Prabang. In itself that was not so strange, kings have stood and fought for their crowns for centuries, but this king was persuaded to stay behind by a blind Buddhist bonze. Laotians are generally ranked among the least martial people on the face of the earth but the mysterious monk had convinced the King’s to stay, he had assured him that the Vietminh would not take the capital, he had seen it in a vision. That settled it, the King was a good Buddhist and stayed. This put the French in a difficult position, they clearly wanted the friendly King out of harm’s way, after all he was their strongest ally among the Indochinese states, but he was also the leader of his country and the French did not want to be seen as imperial masters usurping sovereignty. They had little choice, so, against their better judgment, the French flew in an extra parachute battalion and prepared to defend the city. They also dropped a company from a native Laotian Parachute Battalion along the Vietminh route of advance. It was promptly destroyed. Bernard Fall: “When the Vietminh invaded Laos early in 1953, the French High Command was faced with two choices: evacuate the whole country until sufficient forces were available for its re-conquest or try to hold on to a series of strong points throughout the country which would hold off the bulk of enemy force until such time as the capitals of the country, Luang Prabang and Vientiane, were in shape for a prolonged defense. Since the King of Laos had refused to budge from his royal residence in Luang Prabang, the political necessity for holding on to Laos prevailed over the military factors, which would have dictated total evacuation of at least the northern half of the country. “Dozens of outposts throughout northern Laos were given the assignment to stay put and fight as long as they could in order to delay the advance of several Vietminh divisions now marching into the kingdom. Some of the posts had no choice; they were isolated in roadless territory and, in the middle of the rainy season, inaccessable to aircraft or trucks. Others were given specific missions to hold out for a minimum number of days in order to give the French Command in Laos time to construct a second line of defense. One of the key posts given such an assignment was Muong Khoua. The Vietminh force heading for Luang Prabang had been making solid progress since jumping off. It seemed that they would be on the outskirts of the Laotian capital in no time. Then, improbably, they encountered a tenaciously defended outpost at Muong Khoua north of Dien Bien Phu. A company of Chasseurs Laotiens, Laotian Light Infantry, led by a French captain and three sergeants put up a heroic fight. Knowing the outpost was manned by only a few soldiers, mostly Laotians, the Vietminh most likely anticipated little difficulty in overrunning the outpost. After all, the garrison only had a few light machine guns and a couple of 60mm mortars. Once again, things did not go as planned for Giap’s advancing columns. Against all odds, the feisty bunch of defenders at Muong Khoua repelled an attack by an entire Vietminh regiment! The Communists were temporarily stunned. They lost some of their momentum. Giap was pressed for time, so he rerouted most of the troops through the jungle, bypassing the garrison. But he had lost precious time in the process. A smaller force was left behind to lay siege to the Muong Khoua outpost. Improbably, Muong Khoua’s small gang of defenders held out for over a month, supported at night by flare-dropping C-47s. It was an epic and at times eerie battle — an amazing pyrotechnic show in the jungle covered mountains. Finally, in the confusion, the French captain gave orders to break out. In the dead of night he and his exhausted, ragged, men fired off their last mortar rounds and slipped through the Vietminh lines. Only two of the Frenchmen and two Laotian soldiers finally made it through the jungles of Southeast Asia, through 80 kilometers of enemy-held territory, on May 22, 1953. When they emerged from the jungle at Phong Saly they were said to have looked like “christ off the cross.” Muong Khoua was to become a symbol of heroism in Indochina for the French. Its lightly armed garrison had held off a heavily armed force for over a month. The Vietminh advance did reach the outskirts of Luang Prabang, but they were several days behind schedule. It made the difference. Muong Khoua had delayed Giap’s advance just enough for the French to fortify the city. The French also had time to lay a successful ambush. On May 6, 1953, they attacked. The Vietminh flinched. The next day the skies opened-up and monsoon rains poured down with a vengeance. Giap could go no further. Luang Prabang was saved. The blind bonze’s prophecy had come true. Meanwhile events played out less well for the French further east as they tried to slow down Giap’s other spearhead that was marching south. The French had occupied a potential airhead on the Laotian/Vietnamese border at the town of Sam Neua which lay at a critical point along the best route of advance toward the Plaine des Jarres. On the heels of the heroic actions at Na San the French may have felt that they were on a roll and that their fortunes would continue. In late December, in response to events during the first phase, French commander Salan had garrisoned Sam Neua with the 1ére Bataillon des Parachutistes Laotiens, the 1st Laotian Parachute Battalion, backed by a company of French airborne engineers sent in to improve the runway. Then in early April, as Giap’s offensive was firing back up for phase two, Salan sent in reinforcements to Sam Neua, one additional battalion. He had anticipated Giap’s logistics and had correctly determined that the Vietminh spearhead aimed at the Plaine des Jarres would follow the path adjacent to the outpost. So what happened?… why did events play out differently for the French at Sam Neua than at Na San? Because Salan inexplicably ordered Sam Neua abandoned. Why? French sources are fairly mute on this subject, but it was possibly due to a lack of confidence in the ability of airpower against forces camouflaged by the jungle canopy, after all the runway was towered over by sheer karst ridges that were well within 75mm recoilless rifle and 82mm mortar range and too far away for the garrison to march out and hold them. If the place were to be held, the French perimeter would have to be huge, and they were drastically short of troops to carry that off. That turned out to be a bad call, especially for the poor souls who were defending the field. Things quickly turned ugly. The details are sketchy, but it appears that Salan ordered evacuation of the best troops by air first, which hardly helped the morale of those left behind. Then, on the 12th of April, just as the Muong Khoua garrison was beating back the first Vietminh attack, the remaining 1,700 French troops evacuated Sam Neua, on foot, speeding down the road toward the Plaine des Jarres with the Vietminh hot on their heels. The evacuation turned into a route. Two days later, thirty miles out of Sam Neua and fifty miles from the Plaine des Jarres, the leading elements of the 316th Division caught up with the French. A quarter of the French force, mostly T’ai and Lao irregulars, vanished into the jungle and the rest took heavy casualties. A renewed attack the next day broke the force; fifteen of the twenty-two French officers were killed or captured. Only 220 men made it to the Plaine des Jarres. Sam Neua was a disaster for the French. But by the time that Vietminh forces finally did close in on the target a major French camp had grown up there. To make matters worse for Giap, from the skies came the deluge of the wet monsoon. The Vietminh had to pull back again. Through all of this the French were assisted faithfully by hill-tribe partisans. T’ai or Meo (aka Hmong) were extremely effective guerrillas and proved time and again to be a thorn in the side of the Vietminh. They were highly effective at raids and ambushes in the incredibly rugged areas in which they lived. They understood the terrain and knew the local geography better than the Vietminh. And, the local populace was by-and-large hostile to the Vietminh, thus serving as fertile ground for intelligence. But Giap’s Winter/Spring Offensive had succeeded somewhat in taking some of the shine off the French military for many. To the French, using tribal guerrillas to defend against the Vietminh in the Tonkin/Laotian border region became an increasingly acceptable option, but many of the guerrillas themselves were becoming somewhat gun-shy in the face of the Vietminh advances. If the Vietminh came back to attack Luang Prabang, for example, the French clung to the belief that they could establish a base on the border, protected by tribesman, from which to launch partisan attacks in the surrounding area against the Vietminh. Salan, in fact, proposed the seizure of Dien Bien Phu shortly before he handed over command to his successor Navarre. By this time the Americans had joined the French cause in Indochina wholeheartedly. At first, in 1945-47, the U.S. looked at it as a French colonial brush fire war. If anything, our attention was focused on events to the north as Mao’s Communists were running Chiang Kai-shek’s Koumintang army out of China. Everything changed abruptly on June 25, 1950 when the North Korean People’s Liberation Army attacked south over the 38th parallel and drove all the way to Pusan. Suddenly, the U.S. was faced with fighting its first limited war. Blustery speeches notwithstanding, nuclear was not an option. Korea was a major turning point in our national defense policy. It was also a major turning point ideologically. We no longer looked on the war in Indochina as a nasty little French colonial war against nationalist rebels. It had become part of a common struggle against monolithic Communism. At that point, the U.S. began throwing big money and equipment at the French effort. To end, 1951-52 had been a bad stretch for the French in Indochina. Yes, they had some successes to hang their hats on– Na San, the failure of Giap’s Laotian campaign, but when they looked up at the end of the day they had clearly lost significant ground to Ho Chi Minh’s people’s war. In order to turn things around, if at all possible by this late date, the French needed a truly bold readjustment of strategy. Unfortunately for them that type of thinking was not forthcoming. Instead, French military and political policies remained tied to a course that so far had come up empty. After de Lattre they suffered from the bad combination of mediocre leadership mixed with blind hubris. They never seemed to learn from experience, unlike their enemies, and they continued to think inside the box, a box that continued to shrink around them. True to form they appointed a new Commander-in-Chief, General Henri Navarre who promptly submitted the Navarre plan, which was more of the same bad medicine for the French. For their part, Giap and his staff began planning for the next Winter-Spring campaigning season. The Vietminh would be poised to strike at the end of the southwest monsoon in October- November 1953. The two sides were once again on a collision course, the stage was set for the decisive confrontation. This time the French chose the field, a tiny crossroads village not far from Muong Khoua called Dien Bien Phu.